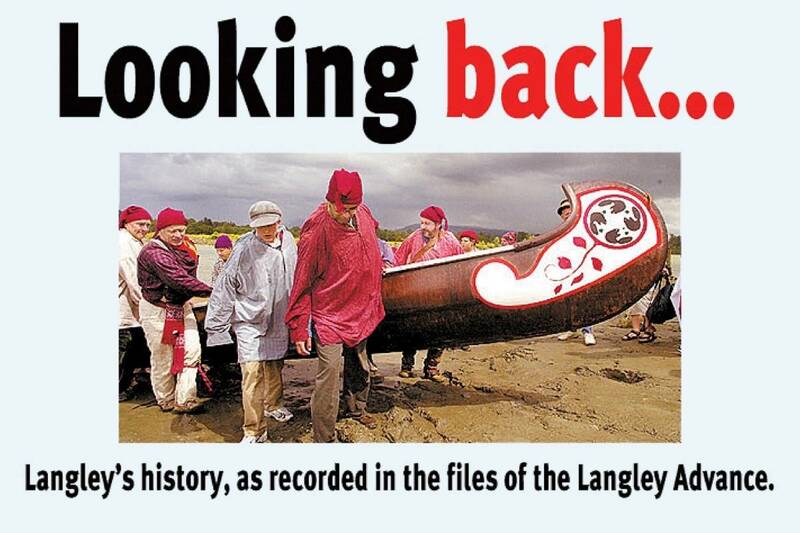 History from the files of the Langley Advance, which has been published since 1931. Nov. 22, 2017 5:30 a.m.
Rev. William Deans was the speaker at the Remembrance Day ceremony held at Athletic Hall. The service was conducted by Rev. W.R. Walkinshaw. Mrs. J. Powell sang Face to Face and Crossing the Bar, and the last post was sounded by Glenn Powell and Stan Bishop. Piper James Duncan played Flowers of the Forest. MP Tom Reid called for construction of a causeway from Fort Langley to McMillan Island, to replace the old Haldi Bridge. He claimed it would solve the silting problem in Bedford Channel. A 13-mill increase was forecast for the Township’s 1958 budget. Former reeve (mayor) Noel Booth was alarmed at the prospect of a lowered water table in the Brookswood area, following word that Langley City planned to sink a well there for its own water supply. He asked the City to guarantee that groundwater levels would not be affected south of the well. When Geof Rowley concluded his term as president of the Aldergrove Chamber of Commerce, he predicted difficulties for the chamber unless it attracted new members and current members were persuaded to become more active. Blows were exchanged during an all-candidates meeting at Willoughby Elementary. A tussle developed between meeting chair Steve Hunchuk and sitting Back to Basics Bunch school trustee Dave Bell (neither candidates in the current election campaign). That, coupled with other altercations, resulted in Bell’s ejection from the meeting. Police were summoned, but they arrived after the fracas had ended. An inquest attached no blame to the death of a man who died after he was subdued a second time by police officers who were transporting him to Riverview Hospital after he had created a disturbance at a Langley church. The Attorney-General’s office offered to supply an arbitrator to break an impasse between Langley City and Township, more than two years after the two municipalities had come to verbal blows over potential locations for a new police headquarters. Eighty-six per cent of eligible Langley teachers signed up with the B.C. Teachers Federation. A tentative agreement reached between the B.C. Nurses Union and 19 long-term care facilities included a 12.2 per cent wage increase for nurses. The Supreme Court of Canada refused to hear Langley Township’s case against a local mushroom farm, increasing the likelihood that more composting operations would start up. Dr. Robert N. Thompson, an international statesman, a member of the Order of Canada, and a major proponent of Trinity Western University, died at the age of 83. The Fort Langley resident had held political and diplomatic posts in India, France, the United Kingdom, the U.S.A., Ethiopia, and several other African nations. In Canada he was leader of the national Social Credit Party from 1961 to 1967. His list of accomplishments during and following his political career was extensive. The Robert N. Thompson building and a major annual scholarship at TWU were named in his honour.